John Flucke's Blog - Ramblings of Dentistry's Technology Evangelist: Gendex GXCB-500 3D Event at my office Tonight! 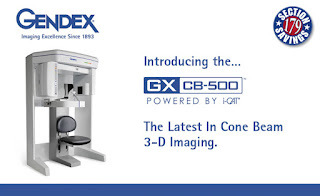 Tonight (November 6) at my office in Lee's Summit there will be a special demonstration and discussion of the Gendex GXCB-500. This event is sponsored by Goetze Dental. We'll be having food and discussion why the GXCB-500 is the perfect solution for doctors looking to incorporate conebeam volumetric imaging into their practice. Goetze is my favorite supply company and will have representatives there to answer all your questions. I'll also be available to answer questions from a user's perspective.